The Lincoln City Library and Reading Room Association was originally organized in 1875, two years before the state legislature passed an act establishing and maintaining free public libraries. The library was officially incorporated as a city-owned, tax-supported institution in 1877, and given an initial appropriation of $100. The library collection was moved three times, eventually finding a home on the second floor of the Masonic Temple, where it grew steadily until a disastrous fire on September 16, 1899 destroyed the whole building. The entire library collection went up in flames, with the exception of the 800 books that were on loan to patrons. Through the efforts of Mrs. William Jennings Bryan and other public-spirited citizens, the plight of Lincoln’s library was brought to the attention of industrialist Andrew Carnegie. Carnegie, who financed the construction of 2,800 libraries in his lifetime, agreed to donate a library if funds could be raised locally to purchase a site. The people of Lincoln raised $10,000, including donations of pennies from schoolchildren, and property was purchased at 14th and N Streets. 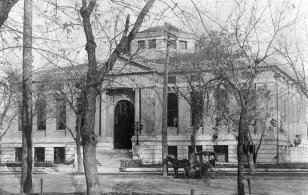 The first Carnegie library in Nebraska (there were eventually 68 others) was then built on the property, and dedicated on May 27, 1902. “Old Main” served the city until 1960, when Mr. and Mrs. Bennett Martin donated $300,000 to finance the construction of the Bennett Martin Public Library on the same site. Lincoln’s original growth was to the northeast, and in 1909 citizens in that area donated $1,100 for the construction of the city’s first branch library. Andrew Carnegie again furnished the building, and the Northeast Branch was built at 27th and Orchard. Northeast Branch remained in service until 1982. In recent years the historic Neo-classical revival building has been relocated a few blocks north, where it now is part of the Matt Talbot Community Kitchen & Outreach Center. In the 1910s, Carnegie grants were also secured by the towns of Havelock, University Place and College View. When these towns were annexed by the city of Lincoln, their libraries became part of the Lincoln City Library system, bringing the number of Carnegie-assisted buildings in Lincoln to five. In 1937 the Bethany Womans Club and the Bethany Women’s Missionary Society donated their collections to establish a Bethany Branch in an old bank building on North Cotner. The present Bethany Branch library was constructed in 1958, three years after South Branch library had been built at 27th and South Streets. The Belmont and Arnold Heights libraries began as mini-library additions to recreation centers in their neighborhoods, graduating to full branch status in later years. Both were replaced by the Eiseley Branch which opened in 2002, as did the Walt Branch in southwest Lincoln. Aging Carnegie libraries in Lincoln’s northeast and southeast neighborhoods were replaced by Anderson Branch (serving the Havelock and University Place areas) and Gere Branch (serving south Lincoln and the College View area) in 1971. Citizens approved a bond issue that allowed Gere Branch to be remodeled and expanded in 1994, and several other branch libraries have been renovated in recent years. In 1967, federal funds and a gift from Lillian Helms Polley financed a building project which added north and east wings to the two-story Bennett Martin library. Two additional floors were added to Bennett Martin in 1977 to house administrative offices, meeting rooms, and the Heritage Room of Nebraska Authors. In the late 1980s the library converted from the old card catalog system to computerized PAC (Public Access Computer) terminals. The libraries have responded to changes in technology, as films have given way to video cassettes and later DVDs, phonograph records have been replaced by compact discs, and computers have brought new services and new possibilities, including downloadable eBooks and streaming audio and video. Planning for the future continues as Lincoln City Libraries attempt to offer efficient and responsive public library service to all our users! Text written by Scott S.; updated December 2015 by Peter J.